Well, this is my week back from my tour of Spain. My family and I went in celebration of my 30th birthday. The big 3-0! Yeah, don’t ask me how I feel about that yet. We toured the Spanish cities– Madrid, Sevilla, Granada, Barcelona– and experienced the life of the Spanish, our conquistadores. Regardless, our trip during Semana Santa and were extremely pleased with the entire experience. If you follow me on Twitter, Instagram or we’re friends on Facebook, you’ve seen my photos over these past few weeks. Take a look. My return to Granada was awesome. I remembered everything as if I was there two years ago, not 10. We sat at the same restaurants we sat at, we drank the same beer I did and were able to hike up the mountain sides. My mom actually made it up to the Mirador de San Nicolas! I was extremely proud of her. I didn’t want to leave, but alas, after three nights there, we were off to Barcelona to end our trip after another three nights there. We were flying up to Barcelona and had to leave extremely early in the morning. My sister and I packed our things together the night before, took showers, and were set to go. We woke up at 6am, had breakfast at 7am and were out the door and in the cab to the airport by 8. Everything thus far was going smoothly and we were having a great time. It didn’t matter how many times I told myself it was going to be fine, I still felt so guilty. How did I forget it? Was it just a slip of the fact from my memory? Was everything else just too important for me to remember to take the insulin? Regardless, as soon as I got through security, I told the TSA agent that I had forgotten my insulin at the hotel and if there was any way to call and see what we could arrange to get it back. The Guardia Civil, or the cops, took my mom and I back to the office where they called the hotel for us. We told them what happened and they asked if I could get a later flight or if I could wait to have the insulin by Tuesday. The officer was reassuring, however, once we got off the phone and told them we would call them back to make arrangements. “She can go to the pharmacy and buy the insulin, that’s not a problem. If they need a prescription, you can go to the ER at the hospital and they’ll write it out for you,” he explained. I still couldn’t get the thought out of my head; how could I be so stupid? We left and upon arriving in Barcelona, I went to the pharmacy where I could purchase rapid acting insulin pens for $54. When I got back to the hotel, my mother was relieved as were the hotel staff who heard about this accident. I was saved. I kind of had to McGyver it still. I had a bit of insulin left in my pump (more than 24 hours worth). So what I did was slowed down the basal, which I had to do anyway after all the walking we were doing. I had woken up twice already from blood glucose in the 40s. Any time I would eat anything, I would inject it with the pens I bought. 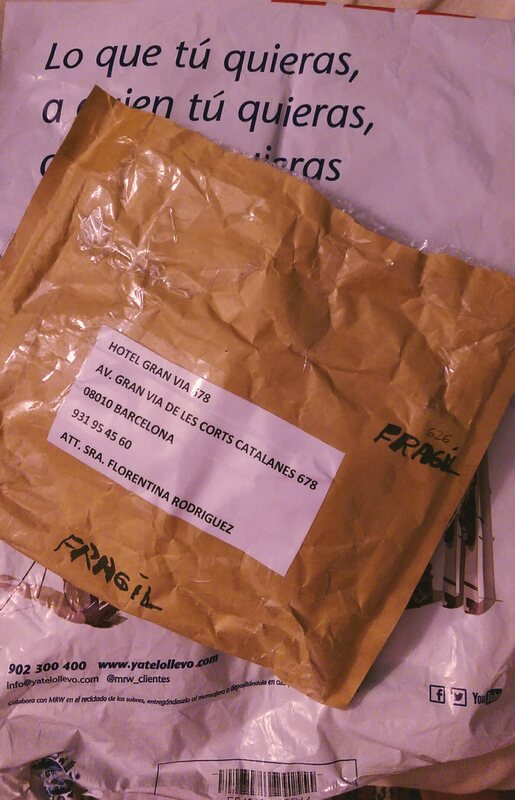 My mother arranged to have the forgotten bottles sent to us in Barcelona. There were three, so I wasn’t going to leave them behind as wasted medication. And, if you don’t already know, this all worked out. Waking up on Wednesday, I got a text from my mom saying that they just delivered the insulin and that they had it. Within two hours, I was low on insulin and everything was perfectly timed. As much as I’d love to fly out the door without thinking about it, this reminded me that I had to– even on vacation. This isn’t the first time I forget something important, but the first time forgetting on an important trip and so much of it, was a first. After having all the insulin, I wrote a note to myself to remember the insulin in the fridge, and also on my phone as did my sister. We were covered. What suggestions do you have? Has this ever happened to you? You don’t need a prescription to buy insulin in Spain. The only reason the police told you where to get a prescription is because a prescription allows you to buy the insulin for about 10% of the retail price. I’m a Spanish resident, and I buy Humalog for my insulin pump. Retail its about €42 for 15ml (100 units per ml). With a prescription it costs almost €5. And you can use the KwikPens to fill your pump the same as you would use a vial. I once got some Humalog U-100 KwikPens and used them in my pump for the next month with no problems. But I prefer the vials as I used them for 20 years in the states. Yeah. I know you don’t need a prescription, which is how I bout the pens anyway. Thanks for reading! Thank you fort his post. My husband left his insulin in our hotel fridge and realised it the next night. Thanks to you post we were able to easily quell our anxiety and hop over to the 24 hour pharmacy just down the street!